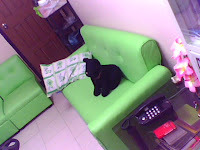 We're already one month in our new home. We had just transfered last April 18. And now we're enjoying our new place, more relaxing, more cool one! And to give you the benefits, I will allow you to invade our home. Yup, you have the right to view some of the portions of our home! c",) Be the first to see it! C'mon. Let's go. First of all, I will tour you in our Sala. How does it look? Will you like it? Here is our brand new sala set. Do you like the color? 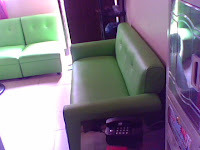 Well, we prefer to choose green because green is a relaxing color. 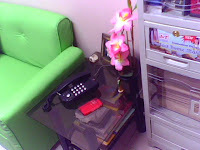 The color green relieves stress and fatiques. I love to sleep there. It gives me a cooling breeze. Beside the sofa is our side table. Our telephone was in it. So whenever I talk to the other line from a long time, it doesn't anymore makes me tire. 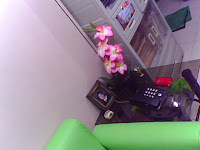 Beside the phone is the flower base together with my Graduation photo frame and the small mini-statue of Saint Joseph! I like your new place. The sofa set rocks. Nice color, very relaxing. Tour us in your room next time!